About "SHSAT Practice Math Test"
(C) only x = 0. (D) only positive values of x. (E) all values of x. Hence V is multiplied by 12. You have 10 large boxes that can each hold 8 soccer balls, and 10 small boxes that can each hold 5 of the same soccer balls. If you have 99 soccer balls, what is the greatest number of boxes you can completely fill? Large box can hold 8 soccer balls each, small box can hold 5 soccer balls each. By choosing 8 large box, we may place 8 soccer balls each. So, in large box we will have 64 balls. Now we may place these 35 balls in 7 small boxes containing 5 balls each. Hence the total number of boxes is 15. 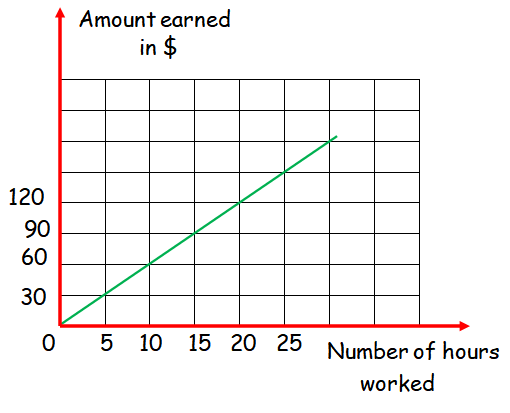 The straight line graph shows the relationship between number of hours worked and amount earned. How much would be earned for 50 hours of work? "y" be the amount earned. The equation y = 6x represents the above relation. Hence the cost earned for working 50 hours is $300. The sum of three lengths is given as 19. If the longest side is 10, the sum of the other two sides would be 9, which is impossible. Hence the longest side must be less than 10. If the longest side is only 6, then the perimeter cannot be more than 18. So the answer is 8. After having gone through the stuff given above, we hope that the students would have understood, "SHSAT Practice Math Test". Apart from the stuff given in this section "SHSAT Practice Math Test", if you need any other stuff in math, please use our google custom search here.